Air conditioning and refrigeration accounts for up to 60% of a business’ electricity consumption. In today’s competitive market, not only does it make sound financial sense to optimise HVAC&R systems, but cleaner indoor air can also improve occupant comfort, health and productivity. Over time, HVAC coils dramatically deterioriate in performance – coils collect air-borne contaminants, becoming dirty and less efficient. A dirty coil is unable to supply correct heat transfer, and heat exchangers can use up to 47% more energy. When running with dirty coils, a non-cleaned unit consumed about DOUBLE the electricity of a unit with clean condenser coils. This appears to be “higher hanging and yet unpicked fruit on the energy efficiency tree”. (Source: Facility Management Australia, ‘Significant savings from refrigerator and freezer coil cleaning’). Cooling capacity can be reduced by up to 40%, while moisture around the evaporator coil and condensate pan can become a breeding ground for bacteria and mould. Like to discuss your cooling units? It makes financial sense to optimise HVAC systems through cleaning and sanitisation. Our technicians are fully trained and HACCP qualified to safely remove biofilm, mould and bacteria from coils and surfaces. We clean and sanitise all forms of air cooled equipment: Fan coil units, air handling units, condenser units, wall split systems, split ducted air conditioning, chillers, fan coil units, evaporators, exhaust fans, cold storage facilities and cool rooms. We clean and sanitise all brands, including Bitzer, Acpac, Buffalo Trident, Cabero, Guntner and Euroclima. Coolclean provides a fully traceable service for audit purposes. This includes a comprehensive report for each cooling unit, together with photographic evidence, and a Coolclean service sticker. Break the contamination cycle. Air handling units, evaporators and fan coil units act as prime incubators to recirculate mould and bacteria throughout a building. 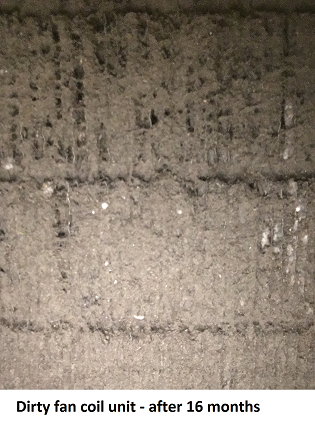 Leaving mould spores and contaminants in HVAC systems can cause health issues and indoor air quality complaints. Established common mould-related sickness includes hayfever-like symptoms in response to allergies, and breathing difficulties from asthma and airway restriction. Active fungal growth can cause building occupants discomfort and irritation, and increase the risk of respiratory illness. Fungal infection, inherently hard to treat, usually limited to those with pre-existing health conditions, severely impacts smaller numbers of people. Studies show that better indoor air quality can improve occupant health. Cleaner filters and coils minimise the spread of bacterial contaminants. It is therefore important to implement a pre-emptive plan to prevent biological growth in HVAC systems. 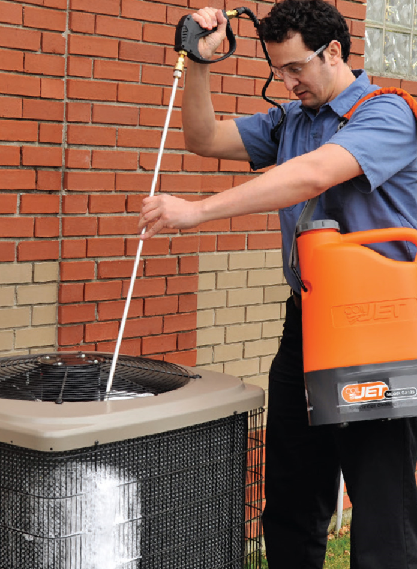 Hygiene Protection ensures that HVAC systems maintain a high level of hygiene. 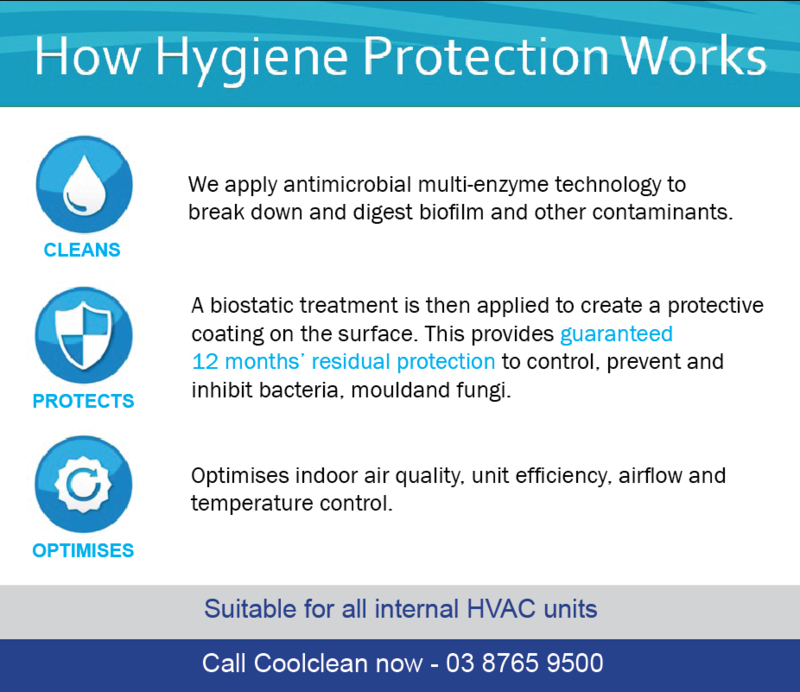 By adding the option of Hygiene Protection to HVAC Cleaning, your units will receive ongoing protection against mould and bacteria for a minimum of 12 months. Performance validated by HACCP and CSIRO, the treatment cleans and removes contaminants from coils and surfaces, while the application of a residual biocide provides ongoing protection. Cleans: Patented antimicrobial multi-enzyme technology is used to break down and digest biofilm and other contaminants. Protects: The treatment is applied to create a biostatic protective coating on the surface. This provides residual protection to control, prevent and inhibit mould, fungi and bacteria. Optimises: The unit is optimised to deliver better indoor air quality, energy efficiency, improved temperature control and corrosion control. The treatment protects assets from re-contamination and maintains overall system efficiency, saving up to 15% in electricity costs. The treatment has been adopted by Accor Hotels Group, Marriott Hotels, BlueScope Steel, Fresh Freight, Cushman & Wakefield, Broadspectrum (formerly Transfield Services), Queensland Health, among others. It makes financial sense to optimise HVAC systems through cleaning and sanitisation. Contact us to discuss your requirements.